Gone are the days of business cards being your business lifeline; times have changed with the introduction of technology. However, business cards are still popular when it comes to exchanging contact information. People like something tangible; it’s good to exchange something physical. The business card has evolved; it’s no longer just a list of your contact details, it’s so much more than that nowadays. A business card can be used to give others a small taste of where your talents lie. It’s especially important when it comes to creative industries; if your business card is boring, then why would someone hire you in the creative space? A business card with just the right amount of information, and the correct design can help you stand out from the crowd and make others remember you. It’s great for networking and connecting with others, it helps you promote your business and your work. A word/phrase that tells people what you do like writer, web designer, photographer etc. Now that you’ve got the basics, what next? There are loads of things that you can do with a business card. Take the time to think about your business card design, and come up with some unique ideas to make you stand out. Typography could be the most important component of business card design. A business card is a small space, so getting this wrong will confuse those who read it; you’ll be forgotten as they walk out the door. A common error when it comes to business card typography is that it’s small, so make sure it’s big enough to read and highlight the important parts with big typography. A good card design also has a typography hierarchy and structure, just like other forms of writing. Making sure your business card is easy to read, has the correct sized typography and is clear is the first step in creating a memorable business card. Black and white has its place in the design world, but colour is generally more striking and memorable; it will make you stand out. Don’t forget that your business card is part of your overall brand. If you decide to use colour on your business card, it should tie in with the overall colour palette of your brand. A great way to use colour in a smart way is to have a coloured edge on a thick business card. If your contact has a stack of white edged cards, yours will draw their eye and be easy to grab. You’ll be the first they get to, and the first on the list. Everyone loves a good image. Images are easy to see and can say much more than a mere phrase. Show people what you do or your actual work in a clear image. It shouldn’t be ambiguous otherwise it will leave people confused; it should accurately portray what you do. A busy business card will be too hard to read. If a business card is crammed with too much information, it will look messy; simple design can be hugely affective. A clear and concise message will be taken on board much quicker than one that is complicated. Keep it simple and include only things that will make an impact. Social media is becoming the next big thing when it comes to digital marketing. If your company is engaged in social media, then add this to your business card. It’s a sure way to draw people in and encourages them to be engaged; the more interest you create, the more chance of them acting after your interaction. Business cards are physical i.e. people see and touch them. Why not use this as a way to make your business card stand out? Raised text or images can create interest. The longer someone feels or looks at the card, the more likely they are you to remember you. A business card that has raised or sunken text, or curved edges will draw attention. If relevant, including a call to action can help you gauge who is actually looking at and responding to your business card. It could drive traffic to your website or generate leads if it’s done right. Telling the card holder what action they should take may be the best way to get results. You can use your business card to give people a small taste of your talents. Just because it’s a form of business communication, it doesn’t mean that it has to be “vanilla” or boring. Whether it’s through a business card or an email, making a first and lasting impression is key. Why not use your business card to stand out? If you’re in a creative field especially, use your business card as a sample of your work, not just a list of your contact details. If your business card is unique and creative, it is guaranteed to create interest, which translates into more business. 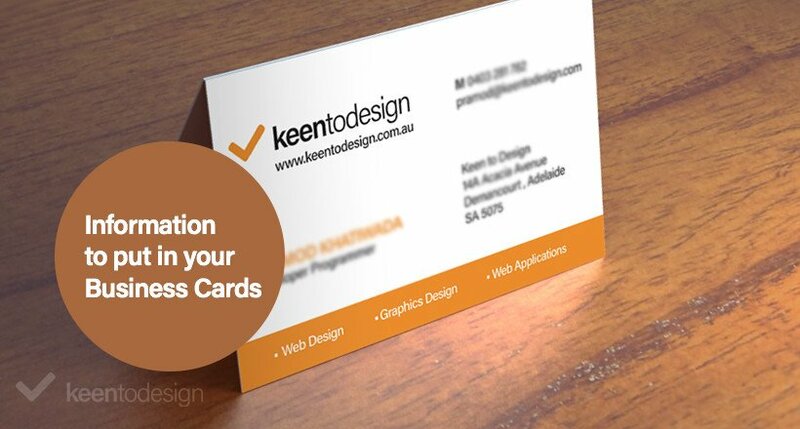 Whatever field you’re in, make sure that you put some thought into your business card design. If it’s done well, it can prompt people to act; if it’s created without much thought, it can stop people from acting.